Still waiting for my Gertbots. The Raspberry arrived and i managed the Bluetooth connection. I have started to program the app. Does the Random function only randomize the direction, or are the tractionary, the spin etc. also randomized? I think you can not recognize the spin if it is generated by chance. Is it important to randomize how many balls are played? @Dave: Can you help me with the pin assignment at the db25 or do I have to measure myself? Btw, I don't have the Amicus. If by any chance you are in the south bayarea of CA, then maybe I can be of help. Dave: If you are reading this, please consider open sourcing what you have as this will help us out a lot and your efforts will not be wasted. Bluetooth Connection to Raspberry via rfcomm. We should work together on an bluetooth interface protocol. Like: How many steps are from the far left to the far right. How many different speed settings are possible. If we define a standard protocol, we can easy share different apps for different devices an use it for raspberry and arduino. Maybe 3 bits for what to change and 5 bits for the amount. Then we only need to send one Byte for every change. After I've been thinking about timing, I think I should throw the whole exercise at once to Raspberry and not every ball individually. The raspberry should then send the individual balls to the amicus and always wait for the signal of the amicus that a ball was played (IR sensor). HI Stefan, this is good stuff! I just got my Amicus and still learning how the control panel works. I'll definitely keep an eye on your posts! After I learned to program in Python and measured a lot on my amicus, I now know how I can control every motor and how I have to process the signal of the IR sensor which stops the ball feed. Now I'm just wondering how the 3 spin engines must work together to get the desired speed and the desired spin. When all 3 engines run full throttle, the ball is shot at maximum speed. What happens when only one engine is full throttle and the other two engines are stopped? Is then the ballspeed = maximum ballspeed / 3? And then there is the spin and the spin direction. I need a formula for each engine, which gives me the required speed due to speed, spin and direction of spin. Even better would be a finished function, like.. Sorry to see that no one seems interested in this project, i am though. And where did David go with his big ambition to make this app? I am going to buy Amicus Advance about this July-August, then I'll look what I can do with the controller. I am the programmer and have experience working with embedded sw (including motor controllers), desktop apps, mobile apps. So, if it is realistic to develop the controlling app without sacrificing the actual play time too much, I'll do it. I have already done this. It is perfectly doable, but you will have to build your own hardware. There is no way to interface to the existing controller. So, don't you want to share/sell you SW/HW? I've had the Amicus Professional for awhile now, and I love what the robot can do. I'm really looking forward to seeing everyone's progress with the custom controller. It would be nice to have a community backed and developed open source project for this. I'm sure there are a lot of people who could help, but just don't have the time to fully commit to it. I would think that when the speed of motor A = B = C (eg when they're all at max speed, or whatever), the ball speed = speedmotorA = speedmotorB = speedmotorC? Custom controller would be amazing. I think I need a little primer to getting started. Very cheap 3d printer parts might be a possibility. I also started to work on a custom controller 2 years ago but I stopped due to lack of motivation. 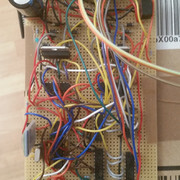 I am a web developer and known nothing about electronic and motor driver but i learned all the way up to build a custom controller. 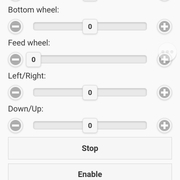 I now have a prototype than can control the Amicus 3000 motors over bluetooth using an android app. The controller also tells the app when a ball was sent (IR Sensor). The controller can also do the "reset routine" (The same thing that happen when you power on the Amicus) needed to position the step motors (direction & trajectory) at the center. My prototype could be easily adapted to the new Amicus (As i built it with 3 wheels in mind even if the Amicus 3000 only use 2) but i don't know the pins on the DB25 connector. steff76: Your posts are very interesting and I ran into the same problems as you. But the best solution might be to measure the signals sent by the original controller for each combination of speed, spin, side spin. I'm wondering, has there been any progress with the custom controller? Seems like a few people have gotten some really good progress.